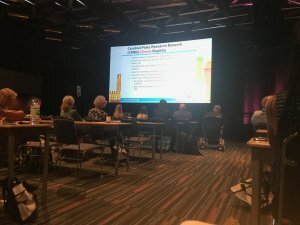 The Cerebral Palsy Research Network (CPRN) was a key topic in many sessions at the 71st annual meeting of the American Academy for Cerebral Palsy and Developmental Medicine (AACPDM) in Montréal this past week. CPRN kicked off its presence with an informational session with the AACPDM board members and CPRN Chairman Paul Gross on Wednesday, September 12, 2017. The board was very engaged in learning about CPRN’s progress in creating a registry and multi-center clinical research capability. 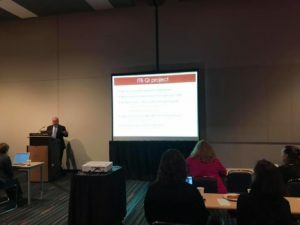 Wednesday evening CPRN held its second annual face-to-face investigator meeting to review the network’s study progress and subcommittee needs. Four site candidates attended the meeting as well as 14 investigators from CPRN. 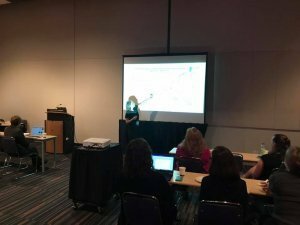 Dr. Amy Bailes presents CPRN’s QI methodology at AACPDM. Investigator Garey Noritz, M.D., from Nationwide Children’s Hospital in Columbus, Ohio to a group of approximately 150 attendees. 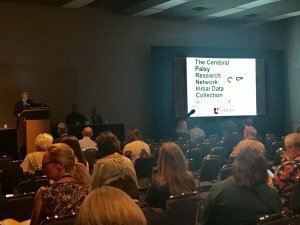 Friday was capped with a presentation about the capabilities of the CPRN Clinical Registry by Marshalyn Yeargin-Allsopp, M.D., from the Center of Disease Control (CDC) during the afternoon general session on registries and population surveillance to 1,100 attendees. Dr. Yeargin-Allsopp, who has directed the CDC’s effort in CP surveillance since it began in the 1990s, detailed the purpose and capabilities of the CPRN as part of her presentation of the landscape of CP registries in the United States. CPRN is proud to be a part of the annual AACPDM meeting.